Members of The New Jersey State Library Talking Book & Braille Center (TBBC) can choose from tens of thousands of accessible audiobooks, dozens of audio magazines, and over 11,000 Braille files. All of these materials can be downloaded from the Braille and Audio Reading Download site (BARD). You must be registered with TBBC in order to register for BARD. Questions? Call TBBC toll-free at 800-792-8322. The audiobooks you receive from TBBC and the BARD files will only play on devices authorized by NLS. The digital talking book player you receive from TBBC is an authorized device. Here is a list of other NLS-authorized devices that can be purchased. BARD Mobile App: Apple iOS, Android and Kindle Fire users can enjoy their BARD materials by using the BARD Mobile App. Both eligible individual NJ residents and all institutions that serve eligible residents can apply for BARD accounts. If you are using a Windows PC and downloading to a flash drive to play on your talking book machine, you might want to try BARD Express. In order to register for BARD, you must first be registered with TBBC. If you are not a member of TBBC, call us at 1-800-792-8322 or download an application. INDIVIDUALS: Apply online here for an individual BARD account. If you are approved to participate, you will receive a “Welcome to BARD” email message. If there is a problem, you will receive a message explaining the problem. INSTITUTIONS: Apply online here for an institutional BARD account. If you need assistance with your BARD application, just call our toll-free number at 800-792-8322. Please note that the information you provide will be shared with the National Library Service, Library of Congress, and with the manufacturer of your purchased digital talking-book player (if necessary). If you have an Android, Apple or Kindle Fire device, use the BARD Mobile app. Visit our BARD Mobile page for more information. Use a flash drive that is between 2 and 8 gigabytes. Your flash drive must be clean with no files on it. Always format your flash drive before you use it. 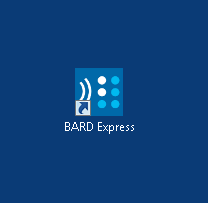 If you have a Windows computer, download using the BARD Express software that you will find on the BARD main page. Scroll down to “Additional Links” and look for BARD Express. Download the software to your computer.